We are counted as top most names in this domain, committed towards providing a wide array of Round Promotional Table. The offered tables are manufactured using supreme quality raw material and latest technology in synchronization with set industry norms. To ensure its sturdiness, this table is tested on various parameters by best quality experts. 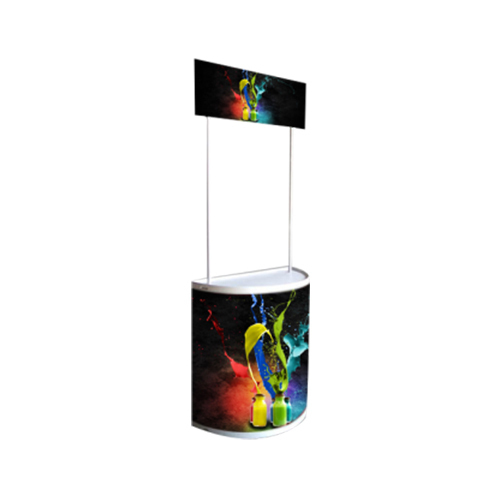 Established in 1998, Sawhney Signage has come up as one of the best known firm Manufacturing, Trading and Service providing of Acrylic Steel Signage, Canopy Demo Tent, Display Stand, Backdrop Stand, Magic Mirror, Writing Board, Crystal Board, Indoor LED Signage, Brochure and Catalogue Stand, Cut Out Stand, Outdoor Banner Stand, Promo Table, Roll Up Banner Stand, Backlit Scroller, Sign Board, Promotional Umbrella and Q Manager. The entire product range is developed in accordance with the industry trends using advanced equipment and tools. These are supplied by us at market leading rates, and are highly praised for its elegant design, flawless finish, and durability and appealing appearance. To cater to the requirements and specifications the products can also be customized as per the need. We are sincerely involved in delivering high quality Printing Services to our valuable customers.